At the launch of RTÉ's new autumn season Miriam O'Callaghan talked to RTÉ.ie about the return of her radio show, 'Miriam Meets' and 'The Late Late Show'. Taragh Loughrey-Grant: Following your new summer radio show on RTÉ Radio One, what made you decide to continue with the show in the autumn season? 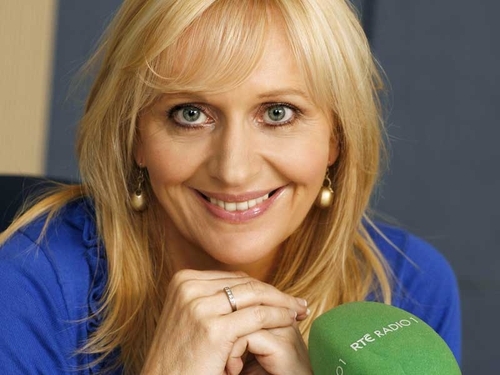 Miriam O'Callaghan: Well they made me an offer that I couldn't refuse on the basis that I just loved doing the radio. I only did it kind of on the spur of the moment, I'd been asked for a good few years and I'd always said no but I have a thousand children and I just thought 'No, this year I'll do it' and I loved it. I've done Television for a long time and I've had such an amazing reaction to radio because I think people are sometimes distracted in television by how you look so I get realms written about dresses, hair all of that. Whereas people listen to you [on radio], I love the medium. I also think it cuts away from all the optics; it does expose you as to whether or not you are an okay interviewer. I think radio is quite intimate like that because you're not distracted by somebody's dress or hair. You know whether or not she's actually listening to the person she's interviewing or not. MO'C: I was very nervous, I've never been a guest on a chat-show for instance and [laughing] I won't ever be a guest on a chat-show and that's terrible seeing as I have my own ['Saturday Nights with Miriam']. I don't really like talking about myself, I'm quite self-conscious. I understand I have to do it for what I do. I did it for Eamonn because I'm very, very fond of him and I did it but I was nervous but I was glad I did it in the end because it kind of talked about me and explained the way I think. TLG: Do you think that experience, being on the other side of the mic, helped you as an interviewer? MO'C: It makes you realise how terrifying it is to be interviewed and that you got to be sensitive to people and go with them and I like to get to the vulnerable bit in people that makes them tick but you have to do that quite delicately and not upset people. I think to be honest that my series this summer [of Saturday Night with Miriam] was my best to date and that's probably because I've just got a bit more confidant and got a teeny bit better and it worked. TLG: Tell us about the style of 'Miriam Meets'. MO'C: My show is less about me and more about trying to draw my guests out. I know in my own private life I'm very good at doing that. My husband always says when I'm talking to people 'Take the Fifth, as in the American Fifth Amendment because even if it’s the guy in the butcher shop, I'm really interested in finding out about his life what makes him tick and if there's a wife and how they relate. So I find it [the radio show] very easy, I love it. TLG: Following the enormous amount of pre-summer speculation over who the new presenter of 'The Late Late Show' would be and ahead of the new season in September, what is your view of the whole thing now? MO'C: The nation must be bored talking about that. It's history now I'll just be sitting down looking forward to watching it when it comes on. It's turned out well for me, it's hard to say that but it has. I just hope it works well and I'll be watching it. TLG: Following the success of both 'Prime Time' and then 'Saturday Night with Miriam', were you ready for a new challenge with radio? MO'C: In one way I wanted to do something extra this summer and when the radio came along it was perfect. It's been an unexpected pleasure, it's another string to your bow. I wanted to see if I could I do it; I might have been a disaster which is always a risk actually, some people haven't transferred from television to radio. Touch wood it worked. TLG: Finally, women seem to be taking over the weekend schedule in RTÉ Radio One with Marian Finucane, Rachael English, Ruth Buchanan and yourself all presenting. MO'C: It's quite interesting. I think it’s a happy accident but I think it's great because there are a lot of male broadcasters everywhere. I don't think it should have been like a positive discrimination but I think it just happened, it just fell that way and it's great. Long may it last. 'Miriam Meets…' airs Sundays on RTÉ Radio One.